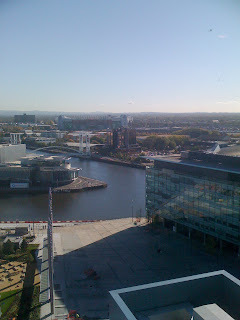 Back from Old Trafford to find lots of comment spam on this weblog. Why on earth people bother to do this I really don't know but clearly, somewhere out there in the world, there are people paid a pittance to leave comments in tortured English promoting fake watches, drugs and worse on the off-chance that some reader would think: "That's a really good idea, I could really use some fake Viagra" and go online shopping! But people do and in large enough numbers to make it lucratively worthwhile for the sinister crime gangs that hide behind the shadowy anonymity of the Internet. At Manchester United this morning after the big game the evening before and Wayne Rooney's future is the talk of the taxi drivers. I had the full ten minute lecture about the club, Beckham, Rooney, nightclubs, girls, you name it from a driver who has seen it all. The area around the quays is vaguely Dubai like with brand new, modern buildings springing-up quickly enough to confuse the taxi drivers; Manchester Media city, with the Imperial War Museum and the football stadium dominating the view. I had a quick and unrestricted wander around the hallowed football ground at an early 8am this morning, pictured on my iPhone, before doing my short talk. Then it was straight back to pick-up the aircraft, programme in the route and make a run through some rain clouds for home, past the eastern side of Birmingham, as high as possible to pick up a tail-wind towards Daventry and the edge of Luton's airspace at Bovingdon, before asking Heathrow radar for a transit to the south side of the Thames across London City, sliding past the now rapidly growing Olympic site at Stratford. Door-to-door in about 2:15 mins from the 'Munich Tunnel' entrance to landing back in Kent. It's quite unfortunate that the scheduled Flybe flight from Manchester and Manston doesn't leave at what I would describe as sensible business times, otherwise I would much rather have let someone else do the flying at less cost. Mind you, doing it oneself is a privilege that most people can't enjoy and avoids all the unpleasant and stressful airport hassle in-between of tedious waiting and intrusive security and of course a dull seven hour car ride.